Here’s a problem almost every marketer has faced. Let’s say you take a look at your conversions for the quarter and the results are not good. Conversions to marketing qualified leads are 10% below where they were last quarter. How do you know what the issue is? One cause of the problem could be that you did not have enough marketing activities. But how do you know? Counting each activity is very narrow and varies by channel. So how can you look at your level of activity across all channels? You want a metric that is meaningful across all channels. In my experience, I’ve found that interaction analysis is a way to look at the amount of activity that you are driving — which will directly correlate with conversions. How does interaction analysis work? If you have a good lead scoring model in place you are already scoring this interaction across channels — so you can use score as a proxy for interaction. The beauty of using score to show interaction is that it is already properly weighted; a web page visit may factor less than a webinar registration into the interaction number, for example. If we were to calculate the gross behavioral score generated for a time period, this can tell us how much interaction there was. (You want to ignore demographic score in most cases as this is usually not a measure of interaction.) See the post Why Behavior Matters in Lead Scoring for more on the difference between behavioral and demographic scoring. 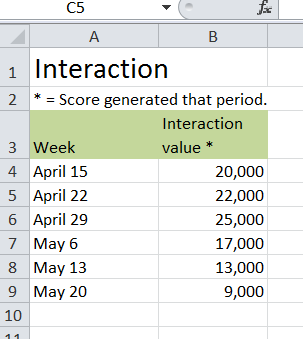 Note: to get these values I took the number of each interaction type each week and multiplied it by the score for that interaction type. To continue this example, there was a precipitous drop in the weekly interaction number starting the week of May 6. This will translate into fewer MQLs and conversions at other stages as well. I do not recommend you compare your numbers to other companies. If scoring models are different you will not be comparing like to like. Interaction is more for benchmarking different time periods. If you make material changes to your scoring model, you will need to reset your benchmark as changes to the scoring model will impact your interaction number. This should be a very early indicator of what is happening throughout your funnel. It should complement but not replace any analysis you are already doing.